Aim: To evaluate the biocompatibility of a new root canal irrigant Q mix™ 2 in 1 in comparison to 0.9% sterile saline, 3% sodium hypochlorite (NaOCl), 2% chlorhexidine (CHX), and 17% ethylenediaminetetraacetic acid (EDTA). Materials and Methods: Six circles were drawn on the dorsal skin of 24 male Wistar Albino rats, leaving 2cm between each circle. Using a syringe, 0.1mL of each root canal irrigant was injected subcutaneously into five circles. In the sixth circle, the needle of an empty syringe was introduced into the skin, but no irrigant was injected (control group). Evaluations were done at 2 hours, 48 hours, 14 days, and 30 days postprocedure. Tissue samples were excised, embedded in paraffin blocks, and 3 μm thick sections were obtained and stained with hematoxylin and eosin. The areas of inflammatory reaction were evaluated. From each tissue sample, five sections presenting the greatest inflammatory reactions were examined under a light microscope, and analyzed statistically by analysis of variance (ANOVA) and Tukey's test. Results: At the two-hour examination period, all the irrigants showed a slight increase in the number of inflammatory cells, at 48 hours, the number of inflammatory cells were increased significantly, and after 14 and 30 days, they were decreased gradually. Qmix™ 2 in 1 showed a smaller number of inflammatory cells than other irrigants tested. Conclusion: QMix™ 2 in 1 was shown to be less toxic to the rat subcutaneous tissue than 3% NaOCl, 2% CHX, and 17% EDTA. During root canal procedures, the irrigating solution will be in contact with pulpal and periapical tissues. Debris as well as irrigating solutions may also be pushed beyond the apical foramen and possibly cause periapical complications. In this regard, QMix™ 2 in 1 may impact on the physiological healing process anticipated during and following root canal treatment. Therefore, the aim of this study was to compare the response of rat subcutaneous tissue to QMix™ 2 in 1, 0.9% sterile saline, 3% NaOCl, 2% CHX, and 17% EDTA. Twenty-four male Wistar Albino rats weighing 250-270g were used for the in vivo experiments. The animals were housed in a temperature-controlled environment with water and food (Kakatiya University of Pharmaceutical Sciences, Warangal, India). All experiments were conducted in accordance with the guidelines of the National Institute of Health (NIH) on the welfare of experimental animals and after approval by the Ethics in Research Committee of the Mamata Dental College and Hospital, Khammam, India. Subcutaneous tissue reaction to the following irrigating solutions was evaluated: 0.9% sterile saline (Parenteral Drugs (India) Limited, Asrawad, Indore, India), QMix™ 2 in 1 (Dentsply, Tulsa Dental Specialties, Tulsa, OK), 3% NaOCl (Prime Dental, Mumbai, India), 2% CHX (Ammdent, Mohali, India), and 17% EDTA (Ammdent, Mohali, India). Under general anesthesia with 5% ketamine hydrochloride (Neon Laboratories Limited, Phalghar, Thane, India), the dorsal skin of the animals was shaved and cleaned with 10% iodine solution. Using a glass template, six circles were demarcated on the dermis of each rat leaving 2cm between each circle. Using a tuberculin syringe, 0.1mL of each root canal irrigant was injected subcutaneously into five circles. For the control group, the needle of an empty syringe was introduced in the sixth circle, but no irrigant was injected. Evaluations were made 2 hours, 48 hours, 14 days, and 30 days after injection. In each examination period, six animals from experimental groups were sacrificed by anesthetic overdose. The tissue specimens were excised with a scalpeland stored in 10% formalin solution for 48 hours. Collected samples were divided into six groups with six samples in each group, according to the irrigant injected. A total of 36 samples was collected at each examination period. The tissue samples were embedded in paraffin blocks. Sections of 3 μm thickness were cut and stained with hematoxylin and eosin. From each tissue sample, five sections presenting the greatest inflammatory reactions were examined with a light microscope (Nikon Eclipse E800) and the characteristic areas were photographed at 20X magnification. Areas of inflammatory reaction were evaluated quantitatively by counting the number of inflammatory cells (neutrophils, lymphocytes, macrophages) using specific software (Image Pro Plus version 6.8, National Institute of Nutrition, Tarnaka, Hyderabad, India). These numbers were statistically evaluated and compared by ANOVA and Tukey's test (Graph Pad Prism 3.0; Graph Pad Software) at 5% significance level. The following results were drawn by comparing all the groups and these are shown in [Table 1]. In the control group, there was no significant relation between the inflammatory reactions at different time periods. In the sterile saline solution group, the number of inflammatory cells were increased in the 48-hour period and there was a significant difference between the two-hour and 48-hour results (P < 0.05) and there was a decrease in the mean number of inflammatory cells at 14 days and 30 days in comparison to the two earlier periods. In the QMix™ 2 in 1 group, there was a significant increase in the number of inflammatory cells in the 48-hour interval and the number of inflammatory cells were gradually decreased after 14 and 30 days. In the 3% NaOCl group, the average inflammatory reaction values were high and there was a significant difference between the two-hour and 48-hour time periods, and after 14 days, mild inflammatory reactions were seen. In the 2% CHX gluconate group, inflammatory reaction reached the highest value at 48 hours with a significant difference between two hours and 48 hours periods (P < 0.05). At 14 th and 30 th day, there was a significant moderation in the values in comparison to the 48-hour results (P < 0.05). In the 17% EDTA group, there was a significant increase in the number of inflammatory cells at 48 hours, and this gradually decreased at 14 th and 30 th day interval in comparison to the 48-hour results. At two hours, only the 3% NaOCl group showed a higher inflammatory response (P < 0.05) compared to the control group. At 48 hours, all experimental groups showed a statistically significant increase in inflammatory cells when compared to the control group (P < 0.05) [Figure 1]. At 14 days, only the 0.9% sterile saline group showed a similar result to that of the control group (P > 0.05). At this time, the 3% NaOCl, 2.0% CHX, and 17% EDTA groups remained with a higher mean number of inflammatory cells compared to the control group (P < 0.05). The QMix TM 2 in 1 solution group presented a milder inflammatory response but still higher than that of the control group (P < 0.05). At 30 days, the 2% CHX and3% NaOCl groups showed a significant mean number of inflammatory cells compared to the control group [Figure 2]. The growing technological evolution and continuous introduction of materials for different applications make the evaluation of the biological properties of these materials a mandatory condition. Materials must not have a deleterious effect when in contact with tissues, before they are marketed and used routinely in the clinic. Following ISO/6876 and 10993-5 regulations,  in vitro cytotoxicity tests, such as tissue and cell culture assays, are important to provide initial evidence of cytotoxic effects. However, these tests lack the interaction of the material with the local cells and the surrounding tissues, including those cells which are attracted to the site of reaction. Group 2 (0.9% sterile saline) showed a mild inflammatory response with a significant increase in the mean number of inflammatory cells only at 48hours. These findings were in agreement with Yesilsoy et al.,(1995)  suggesting that saline resulted in a favorable reaction in the connective tissues and can be considered as biocompatible as tissue repair occurred after 14 and 30 days. Group 3 (QMix™ 2 in 1 solution) showed milder inflammatory reactions at two hours, and the number of inflammatory cells were increased significantly at 48 hours. After 14 and 30 days, the number of inflammatory cells decreased, which might be the symptom of repair following the injection of QMix™ 2 in 1. These results suggest that leakage or pushing of root canal irrigants into periapical tissues during cleaning and shaping of the root canal may alter the inflammatory response in the periapical lesions. Regeneration of tissue occurred at a slower rate in sites where 3% NaOCl, 2% CHX, and 17% EDTA was injected than those with QMix TM 2in 1. The results of this study indicate that QMix™ 2 in 1 solution is less toxic to the rat subcutaneous tissue than 3% NaOCl, 2% CHX, and 17% EDTA. QMix™ 2 in 1 may therefore be considered safe for use as a final irrigant after NaOCl. 1. Haapasalo M, Shen Y, Qian W, Gao Y. Irrigation in endodontics. Dent Clin North Am 2010; 54:291-312. 2. Mohammadi Z, Abbott PV. The properties and applications of chlorhexidine in endodontic: Review. Int Endod J 2009;42:288-302. 3. Hülsmann M, Hahn W. Complications during root canal irrigation-literature review and case reports. Int Endod J 2000;33:186-93. 4. Williams CE, Reid JS, Sharkey SW, Saunders WP. In vitro measurement of apically extruded irrigant in primary molars. Int Endod J 1995;28:221-5. 5. Kuruvilla JR, Kamath MP. Antimicrobial activity of 2.5% sodium hypochlorite and 0.2% chlorhexidine gluconate separately and combined as endodontic irrigants. J Endod 1998;24:472-6. 6. Thomas AM, Chandra S, Pandey RK. Elimination of infection in pulpectomized deciduous teeth: Short term study using iodoform paste. J Endod 1994;20:233-5. 7. Turkun M, Gokay N, Ozdemir N. Comparative investigation of the toxic and necrotic tissue dissolving effects of different endodontic irrigants. J Dent Faculty of Istanbul Uni. 1998; 32:87-94. 8. Siqueira JF Jr, Machado AG, Silveira RM, Lopes HP, de Uzeda M. Evaluation of the effectiveness of sodium hypochlorite used with three irrigation methods in the elimination of Enterococcus faecalis from the root canal in vitro. Int Endod J 1997;30:279-32. 9. Haapasalo M, Udnaes T, Endal U. Persistent, recurrent, and acquiredinfection of the root canal systempost-treatment. Endod Topics 2003;6:29-56. 10. Oncag O, Hosgor M, Hilmioglu S, Zekioglu O, Eronat C, Burhanoglu D. Comparison of antibacterial and toxic effects of various root canal irrigants. Int Endod J 2003;36:423-32. 11. Chang YC, Huang FM, Tai KW, Chou MY. The effect of sodium hypochlorite and chlorhexidine on cultured human periodontal ligament cells. Oral Surg Oral Med Oral Pathol Oral Radiol Endod 2001;92:446-50. 12. Zehnder M. Root canal irrigants. J Endod 2006;32:389-98. 13. Hulsmann M, Heckendorff M, Lenon A. Review on chelating agents in root canal treatment: Mode of action and indications for their use. Int Endod J 2003;36:810-30. 14. Dai L, Khechen K, Khan S, Gillen B, Loushine BA, Wimmer CE, et al. The Effect of QMix, an experimental antibacterial root canal irrigant, on removal of canal wall smear layer and debris. J Endod 2011;37:80-4. 15. Lawrence WH, Malik M, Autian J. Development of a toxicity program for dental materials and products. J Biomed Mater Res 1974;8:11-34. 16. Camps J, About I. Cytotoxicity testing of endodontic sealers: A new method. J Endod 2003;29:583-6. 17. 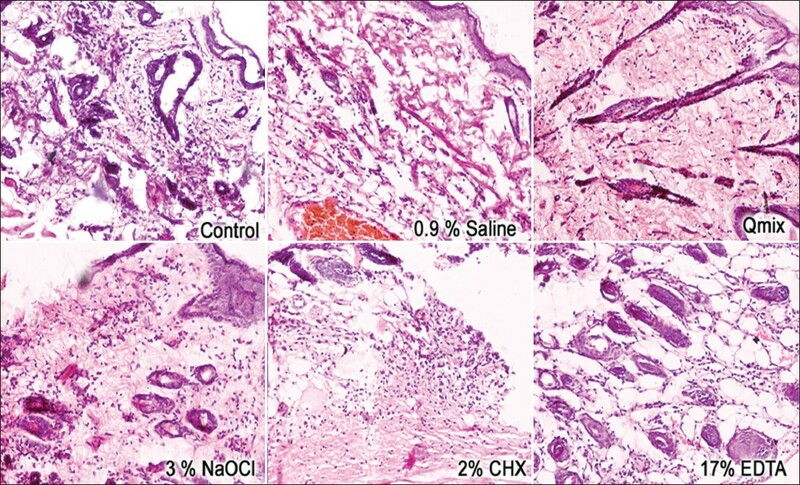 Martínez Lalis R, Esaín ML, Kokubu GA, Willis J, Chaves C, Grana DR. Rat subcutaneous tissue response to modified portland cement, a new mineral trioxide aggregate. Braz Dent J 2009;20:112-17. 18. Gomes-Filho JE, Aurélio KG, Costa MM, Bernabe PF. Comparison of the biocompatibility of different root canal irrigants. J Appl Oral Sci 2008;16:137-44. 19. Pashley EL, Birdsong NL, Bowman K, Pashley DH. Cytotoxic effect of NaOCl on vital tissue. J Endod 1985;11:525-8. 20. Yesilsoy C, Whitaker E, Cleveland D, Philips E, Trope M. Antimicrobial and toxic effects of established and potential root canal irrigant. J Endod 1995;21:513-5. 21. Gatot A, Arbelle J, Leiberman A, Yanai-Inbar I. Effects of sodium hypochlorite on soft tissues after its inadvertent injection beyond the root apex. J Endod 1991;17:573-4. 22. Agarwal S, Piesco NP, Peterson DE, Charon J, Suzuki JB, Godowski K, et al. Effects of sanguinarium, chlorhexidine and tetracycline on neutrophil viability and functions in vitro. J Periodont Res 1997;32:335-44. 23. Segura JJ, Calvo JR, Guerrero JM, Jimenez A, Sampedro C, Llamas R. EDTA inhibits in vitro substrate adherence capacity of macrophages: Endodontic implications. J Endod 1997;23:205-8. 24. Segura JJ, Calvo JR, Guerrero JM, Sampedro C, Jimenez A, Llamas R. The disodium salt of EDTA inhibits the binding of vasoactive intestinal peptide to macrophage membranes: Endodontic implications. J Endod 1996;22:337-40.